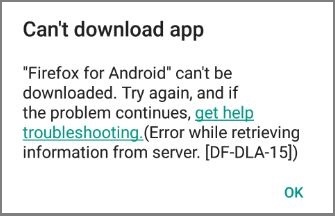 Here’s how to fix the DF-DLA-15 error on Google Play Store. Un-mounting the SD card has worked for most people who had the DF-DLA-15 error, and hopefully it would work for you too. Note that this fix only applies if you currently have an SD card (memory card) on your phone. To un-mount your SD card, go to Settings > Storage, now scroll to the bottom and you’ll find an option for Un-mount SD card. Click on it to un-mount your memory card. Keep in mind that this means to temporarily disable the SD card and you can re-mount later if you want, so don’t freak out or get scared. Now restart your phone and try updating or installing your app. If this works for you, please leave a note of thanks in the comments ☺. If it doesn’t, try fix 2 below. Click on the menu icon (three stripes) on the top left corner of the screen to expand the menu. Close Google Play Store if it’s open. From the list of apps, scroll down until you find Google Play Store. Click on it and it will show you a page with a bunch of information and some buttons. First click on Force stop, then click Clear cache, then click Clear data. Now tap the back button once to go back to the list of apps. This time choose Google Services, then do the same thing you did for Play Store. I believe only the ‘clear cache’ button would be active so tap on that and exit to your home screen. Now try to update or download your app and hopefully, the error df-dla-15 would be gone. Dalvik is a virtual machine that runs applications and code written in Java. It is responsible for executing apps written for Android. Note that only rooted devices can access the Dalvik folder. Download the ES File Explorer app and launch it. Tap the menu (three stripes) button on the top left corner to reveal the menu. Tap Local to expand the selection, then choose Device to reveal the folders. Find the ‘Root’ folder and open it. Navigate to Data > Dalvik. If your android phone isn’t rooted, you won’t see the Dalvik folder. Thanks for taking your time to publish this helpful fix. Thank you so much. Fix number 3 worked like a charm for me on nox player. I cleared cache on both play store and google services, as well as google play just in case. After that the play stored stopped giving me the df-dla-15 error code.